How often will new messages be added? Unity has plans to evolve the skill in the future to allow Daily Word premium and digital edition subscribers to listen to today’s Daily Word message on their Alexa-enabled devices. No specific time frame has been established. Can I save the message? No. At this time, there is no way to save individual messages. For more on Amazon Alexa, visit the official website. How do I replay the message? At this time, there is no way to replay individual messages. No. At this time, the Daily Word skill is not available in Spanish. Do I need a subscription to Daily Word? No. You don’t need a Daily Word subscription. What functions am I able to do within the skill? This skill will allow users to hear a sampling of past affirmations, messages, and Bible verses from Daily Word. What is the wake-up word for the Daily Word skill? How does the Daily Word skill work? The Daily Word skill is called “Daily Inspiration” on Alexa. Alexa-enabled devices provide a sampling of past affirmations, messages, and Bible verses from Daily Word magazine. How many Unity skills are available on Alexa? There are currently two skills available on Amazon Alexa—Daily Word® and Silent Unity®. How do I download Daily Word to my Kindle? You can download Daily Word from the Kindle Store on Fire and other Kindle devices by tapping the NEWSSTAND tab or icon, and subscribe. You can also locate your device on a drop-down menu at Daily Word Kindle Edition and download from there. Where do I manage my subscription? You can manage your subscription from your device by going to: My Account, Amazon Account Settings, Subscriptions, and then to your Amazon account sign-in page. More information can be found at Amazon Newsstand Subscriptions. Can I renew my subscription at amazon.com by logging into my account? Yes, you can renew your subscription by signing into your Amazon account. Sign in and go to Newsstand Subscriptions. If the subscription is not working, can I get a refund? You may be able to get a refund on your subscription. The Amazon EBooks Refunds Page has more information about the policy and how to do so. Can the language be changed to Spanish? No, you cannot change the language on Daily Word to Spanish. You can set your device language to Spanish (under Settings, Keyboard, and Language) but it will not change the language of your Newsstand subscription. Can the font size be changed? Can I save a page as a favorite? Yes, you can bookmark your favorite page by tapping on the bookmark icon located in the upper right corner. Is audio available for my subscription? Daily Word is not available in an audio format. However, the Fire HD device has the capability to read the magazine content aloud. Can I send the word to a friend from Kindle? Does the Kindle version have meditation? Can I contact Silent Unity® on Daily Word Kindle? You will find the phone number for Silent Unity at the bottom of a message page but there are no hyperlinks that will send a message directly to Silent Unity. Are Daily Word Archives available? You can archive as many as seven editions on your device. Any past editions beyond that will be available in the cloud. However, you can only access editions issued during your subscription period (as opposed to before your subscription began). Can I give a Kindle gift subscription? Does Kindle have daily alerts for the subscription? When a new edition is published, it automatically downloads to the device and the cover image of the recent edition is displayed on your device’s home page, under the Newsstand tab. You may subscribe to the print version of Daily Word magazine, delivered to your door six times a year, for $15.95. You may subscribe to the Daily Word Digital Package, which allows you to receive the daily message by email, in the Daily Word Online Magazine, and through your smartphone via the new Daily Word Mobile App. The package is $9.95 a year (just 3 cents a day). You may subscribe to the Daily Word Premium Package, which allows you to receive Daily Word every way it is provided: in print, in your email, online and on your smartphone. This package is $20.95 a year. If you are currently a paid subscriber to the Daily Word print magazine, you may upgrade to the new Daily Word Digital Subscription Package for only $5 a year—a special reduced price. All three subscription options are also available in Spanish. The Daily Word archives are part of the Digital Subscription Package. For unlimited access to the archives, you will need to subscribe or sign up for the free 30-day trial. If you are already a digital subscriber, you will need to log in and go to My Dashboard to access. What if I only want email delivery of the message? Or just the smartphone app? Even if you only choose to take advantage of one or two of the delivery methods provided in the Daily Word Digital Subscription Package, the cost is the same: $9.95 a year (just 3 cents a day), or $5 a year for print subscribers. What if I’m not sure I want the Daily Word Digital Subscription Package? You may try the new Daily Word Digital Subscription Package FREE for 30 days. Sign up here. Within 30 days, you will be given the opportunity to subscribe for $9.95, at which time you may either subscribe or decline. Will my print and digital subscriptions expire at the same time? Not necessarily. If you are already a print subscriber and choose to add the digital package for $5, your print subscription will be up for renewal based on when you purchased it, and the digital subscription will be up for renewal according to when you purchased it. In other words, your print and digital subscriptions will be timed independently. Your print subscription will begin with the next issue being mailed and may not start until several weeks after your order. You will receive six bimonthly issues for a one-year subscription. Your digital subscription will begin as soon as you place your order, although your “official” subscription will be timed as beginning on the first day of the next month and ending 12 months later. If I’m a print subscriber and I add the Digital Subscription Package, will I still only pay $5 when it comes time to renew it? Yes. As long as you are a Daily Word print subscriber, the cost of purchasing the digital package as an add-on will only be $5, both initially and for renewals. Please contact the Unity Customer Care Department by emailing unitycustomerservice@unityonline.org or calling 816-251-3561 Monday-Friday, 7:30 a.m. to 4:30 p.m. CT. I subscribe to an edition of Daily Word that is published outside the United States. Can I upgrade to the Digital Subscription Package? Yes! 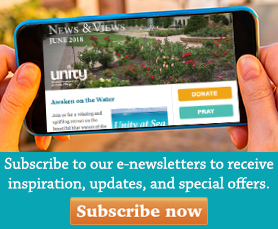 International subscribers are also eligible to receive the Digital Subscription Package at the annual rate of $5 U.S. To subscribe, please contact the Unity Customer Care Department by emailing unitycustomerservice@unityonline.org or calling 01-816-969-2069 (Monday-Friday, 7:30 a.m. to 4:30 p.m. UT-6 CST). Simply click here to get your 30-day free trial started. What happens at the end of the 30 days? At any time during the 30-day trial, you may opt to purchase the Daily Word Digital Subscription Package. We will remind you periodically during those 30 days that you are receiving Daily Word via email, online edition and mobile phone for a limited time only. If at the end of the 30 days you have not purchased the Digital Subscription Package, your email, online edition and mobile phone delivery will end. You may still purchase the digital package at any time. However, you are limited to only one free 30-day trial. Can I give a Daily Word Digital Subscription as a gift? 816-251-3561 (Monday-Friday, 7:30 a.m. to 4:30 p.m. CT). Please note: Be ready with your gift recipient’s name, email and mailing address when you call to place your order. Thank you! You can subscribe online or contact our Customer Care Department to order via phone. What are the features of the print magazine? Daily messages for two months. Each message includes the word for the day, a supporting affirmation, the message itself and a supporting Bible verse. First-person articles with inspiring stories of spiritual transformation. Monthly affirmations for Inner Peace, Guidance, Healing, Prosperity and World Peace. Information on where to call, write or email for free personal prayer support 24/7. Information on other Unity products and programs available to you. What does the Online Magazine with audio include? The Daily Word Online Magazine includes all of the features in the print magazine listed above. The online magazine allows you to use your cursor to flip through the pages of the current Daily Word and listen to each day’s message. Daily Word is written by a dedicated team of spiritual writers who strive to provide inspirational messages that help people live true to their divine potential. Our goal is to remind people of the Truth of their being and provide practical, spiritual tools to live life fully with ease and grace. Daily Word is published by Unity World Headquarters or Unity for short. Unity is a positive path for spiritual living whose purpose is to help people live more abundant, prosperous and meaningful lives. Unity is often described as positive, practical, progressive Christianity. Although Unity follows Jesus as the Master Teacher, the movement also honors and respects all paths to God. You can learn more about Unity and its other products, programs and services at www.unity.org. For additional information or specifics about your current subscription and options, please email the Unity Customer Care Department at unitycustomerservice@unityonline.org. If you need technical assistance after subscribing to the Daily Word Digital Package, please contact Customer Care at 816-251-3561 (Monday-Friday, 7:30 a.m. - 4:30 p.m. CST). Are archives of the magazine available? Digital archives are available to those who have purchased the Digital Subscription Package. With login, paid subscribers have access to the searchable archives within Daily Word Mobile and dailyword.com. Past issues of the Online Magazine with Audio are also available to digital subscribers. Subscribers, visit My Dashboard to access. A library of more than 85 years of print magazines is available at Unity Village where Daily Word is published. Is Daily Word available in languages besides English? Yes. Daily Word is translated into five additional languages and braille. La Palabra Diaira® (Spanish) is published domestically. Visit www.lapalabradiaria.org or click here to subscribe. Eighteen foreign editions of Daily Word are published internationally and translations are available in Dutch, French, German and Portuguese. For more information on our International Affiliate Reprinters, including contact and subscription information, click here. Serving the blind and visually impaired, Unity's Message of Hope® ministry operates solely on donations and consists of two paid staff members and a group of dedicated volunteers. Message of Hope provides Daily Word in Braille or on CD, free of charge upon request. La Palabra Diaria is also available on CD for our Spanish-speaking friends with visual impairment. Contact Message of Hope by emailing: message-of-hope@unityonline.org. To make a donation to Message of Hope, please email unitycustomerservice@unityonline.org or call 816-251-3561 between 7:30 a.m. and 4:30 p.m. (CT), Monday through Friday. For your convenience, an online donation form is also available. What is the Daily Word App? The Daily Word App allows you to read and share the daily affirmations from Daily Word magazine right from your mobile device. You can also search more than 85 years of archived messages, build a list of favorites, and listen to audio meditation. Learn more. What devices will the Daily Word App work on? The Daily Word App is supported on iOS 8.0 and above and Android 2.3 (gingerbread) and above. Meditations are unable to play on Android 2.3.6. Blackberry is not currently supported. Contact Customer Care at 816-251-3561, Monday-Friday, 7:30 a.m. to 4:30 p.m. CT or email customercare@unityonline.org. How do I download the Daily Word app to my smartphone? The Daily Word App is available through the iTunes and Google Play app stores. A digital subscription is required to access content through the app. Purchase a subscription or try it free for 30 days. The Daily Word App doesn’t work on my phone. Can I get a refund? If you purchased a Digital Subscription Package in order to use the Daily Word App, and it isn’t compatible, you are eligible for a refund on the package. Contact Customer Care at 816-251-3561, Monday-Friday, 7:30 a.m. to 4:30 p.m. CT or email unitycustomercare@unityonline.org. Note: If you receive a refund, you will no longer have access to Daily Word Online Magazine with audio or the daily emails. How do I change from the English version to Spanish? With app running, go to Settings > Language > Choose between "English" or "Español." Protect yourself by being informed. Read this alert for more information.